Well it looks like our good friend Banksy is back to his old tricks again after a prolonged media silence. 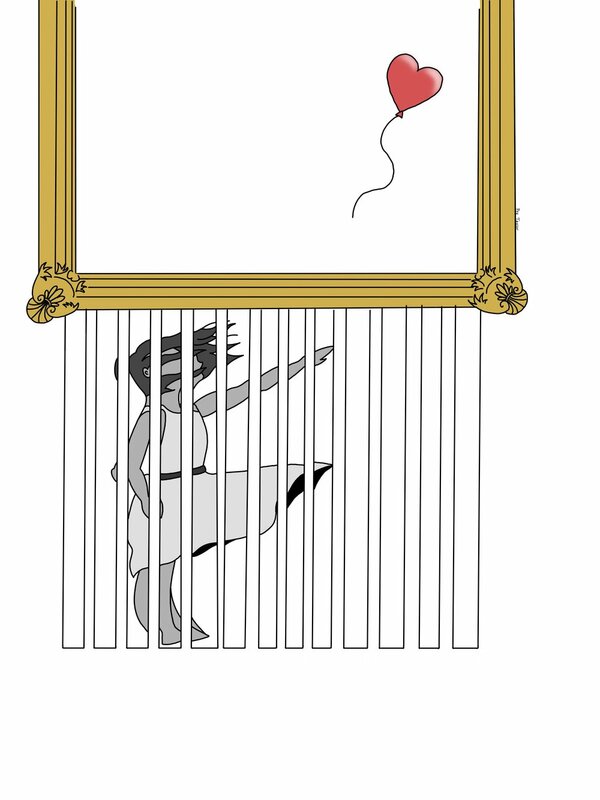 This latest stint by the English artist occurred about two weeks ago at an evening auction in the historic Sotheby’s, when a piece by Banksy titled “Girl with Balloon” sunk into its frame and shredded itself the split second it was sold to an unnamed buyer for 1.04 million British pounds ($1.36 million). The stunned crowd was unsure if this was the work of the enigmatic Banksy himself, but it was later confirmed to be Banksy’s doing by the artist himself as well as Pest Control, a society for the authentication of street art. The image of the half-shredded work, now retitled “Love is in the Bin,” has circulated over the internet and spawned countless cheaply made and cheaply bought imitations on websites such as Redbubble. For an artist who has been known to make pieces that challenge exploitation, capitalism and mass-production, there has surprisingly been no statement from Banksy on these copies. Instead, a short video of the artist bragging about how this shredding contraption was formulated years in advance has been released on his Instagram, with over 2.1 million views. I am not a fan of Banksy or his work in general. In my own humble opinion, his work is similar to the political art of an edgy eighth grader who steals their dad’s Pall Malls and listens exclusively to Morrissey. What I mean by this is that Banksy’s intended critiques are oftentimes not fully educated on their own subject matter. Instead of creating artwork that is well-rounded, well-researched and that recognizes the deep seeded causes of social issues, Banksy seems to make shallow, classist and overly simplistic critiques of modern society. His 2005 work “Napalm,” depicts the appropriated image of Phan Thi Kim Phuc, known as the Napalm girl from Phil Ut’s Pulitzer Prize winning photograph of her at nine years old running naked from a napalm strike in the Vietnam War. Her right arm is gripped by Mickey Mouse, her left by Ronald McDonald. This work, meant to be a statement on consumerism, is insensitive to the traumatic historical context of the Vietnamese people’s suffering during the war by comparing a napalm attack to fast food or popular media. “Love is in the Bin” is not an exception to this pattern. This work seems like a publicity stunt, especially since the name Banksy has not been relevant in the art world since 2014. The ‘destruction’ of the piece was not only for sheer shock value, but actually raised the monetary value of the work, going against what the artist’s rhetoric supposedly stands for — the rejection of for-profit art. It was not truly destroyed, but was simply altered to the point where it was still both sellable and displayable. The buyer was given the option of not purchasing it after the incident, but they declined. If Banksy wanted to make a proper statement on the elitism of the art market and the inaccessibility of art to the common person, the work would have been fully destroyed (and no refund offered). Instead, Banksy and the buyer, an elite consumer the artist seems to be speaking against in this particular work, both benefited from this stunt, which in turn de-radicalized and destroyed the artist’s professed intentions.